A team of researchers at Luleå University of Technology, in Sweden, has developed a new framework for performing visual inspections of large 3-D infrastructures using fully autonomous micro aerial vehicles (MAVs). 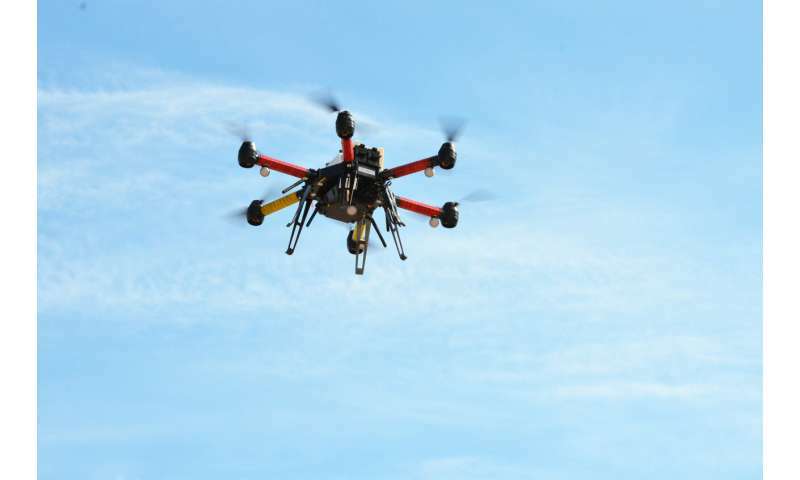 In their paper, pre-published on arXiv, they introduce an aerial inspection system with high levels of autonomy, which could potentially be deployed on a large scale for the inspection of old infrastructures. "Ageing infrastructure are becoming a significant issue for developed societies, with an increased cost and a big danger for the human inspectors performing the overall operation," George Nikolakopoulos, one of the researchers who carried out the study, told TechXplore. "Thus, five years ago, we imagined aerial robots with arms to perform autonomous inspection and maintenance in a more affordable, fast, productive and secure way." In the framework devised by Nikolakopoulos and his colleagues, multiple MAVs are deployed for the inspection of an infrastructure, relying solely on their onboard computer and sensory systems. A modular system that combines localization, path planning and mapping technology ensures that the MAVs can be deployed quickly, reducing the mission's execution time so that it meets the operator's needs. "Given a draft geometrical model of the infrastructure to be inspected, e.g. a box or a cone, we define with our algorithms paths for the MAVs that can guarantee for a complete visual inspection," Nikolakopoulos explained. "The aerial robots fly around autonomously, collecting images while avoiding collisions. Upon landing, the information gathered is transformed into a dense 3-D reconstruction of the infrastructure." The system developed by Nikolakopoulos and his colleagues includes three key components: a geometry-based path planner, an accurate and flexible localization component, and a visual data post-processing scheme. The path planner component effectively plans the collaborative coverage of complex structures using multiple MAVs. The localization component, on the other hand, provides accurate pose estimations for the MAVs using an ultra wideband (UWB)-fused inertial estimation scheme. Finally, the post-processing scheme allows the researchers to build 3-D models of the infrastructures, using the visual data gathered by the aerial vehicles. "The major scientific and technological impact of our study is the fact that the multiple MAVs are operating in a non-human-supervised approach," Nikolakopoulos said. "They have very high level of autonomy and a full industrial manufacturing to perform the required inspection tasks. To the best of my knowledge, this is the first time ever that MAVs have been deployed for wind turbine inspection worldwide." Nikolakopoulos and his colleagues evaluated the performance of their autonomous navigation system in a series of realistic outdoor field experiments that entailed the inspection of large-scale infrastructures. These tests primarily focused on the inspection of wind turbines, which are particularly challenging structures. The results gathered in these preliminary evaluations are highly promising, highlighting the merits and potential of the proposed system for the inspection of large and complex infrastructures. 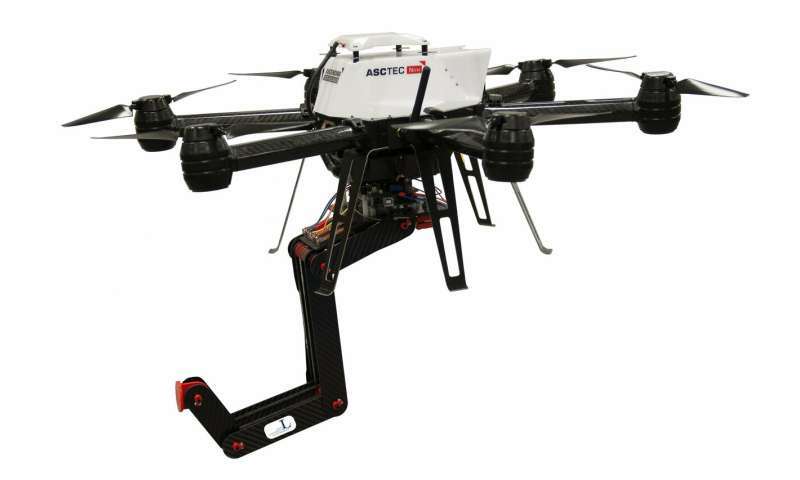 In the future, the approach developed by Nikolakopoulos and his colleagues could be deployed on a large scale, paving the way towards fully-automated inspections using aerial robotics. "We are now in the stage of commercializing the overall idea both as a service and platform, thus we are fully working in building our spinoff and strengthening the future financial plans," Nikolakopoulos said. SuperviserAI link to nice 64GB, 6Gz desktop to make that 3-D image on the fly and scalable. Engineers watch in real time. Other, larger droids with attachments move in also real time for repairs. If welding or high heat needed, a ground based precision laser do that with mini-droids holding the pieces together for welding....all work coordinated by 6Gz desktop in cushy office..soft chairs....coffee on desk..
On the other hand, such could also make automat combat teams in Afghanistan to reallly coldly take out ISIS hidey holes, 24/7/365 whenever...wherever..give ISIS NO rest, EVR.. On the ground...In the air....under sea.....We ARE forever there..Pound the enemy...down into....the ground!--- New Marine Corps AI basic marching song!